In 2009, the Savage Rapids Dam of Oregon was eradicated. In 2014, the Glines Canyon Dam in Washington was uprooted. Nationwide, over 1,300 manmade dams have been removed since 2015. 2016 is the year for Klamath River to return to its dam-free flow through Oregon and Northern California. A multi-party Klamath Basin Restoration Agreement was signed in early 2008 as a resolution of various issues and debates over complex water rights in the Klamath Basin. These parties included the state of California, the state of Oregon, various Native American tribes, four counties and 35 other local organizations and individuals. This restoration agreement intends for the dismantlement of the four Klamath River Hydroelectric Project dams, all of which were privately owned by the electric power giant PacifiCorp. Removal projects allow the rivers and fisheries, crippled by the dam’s construction, to be renewed and reinvigorated. From a cultural perspective, these projects reveal a more intrinsic shift in the way Americans relate to their natural environment, portraying it as more than just a means to an end for hydroelectric energy, agriculture, and economic growth. Historically, the river system supported a thriving ecosystem of Chinook and coho salmon. These fish became the core of many California Indians’ nutrition, wealth, and culture. Each spring would yield tens of thousands of the fish, often weighing upwards of 40 pounds. His tribe, in collaboration with neighboring Yurok and Hupa tribes, has been dependent on the flourishing of these fish. However, the very position of these dams acted as a physical barrier to the salmon’s known spawning grounds. In the span of less than half a century, 300 miles of former salmon habitat have now become inaccessible. Salmon numbers in the Central Valley and in the Klamath have continued to decline, from historic returns of 4 million to only a predicted 50,000 Chinook expected to return this year to fertilize their eggs. This will be one of the river’s poorest returns on record. 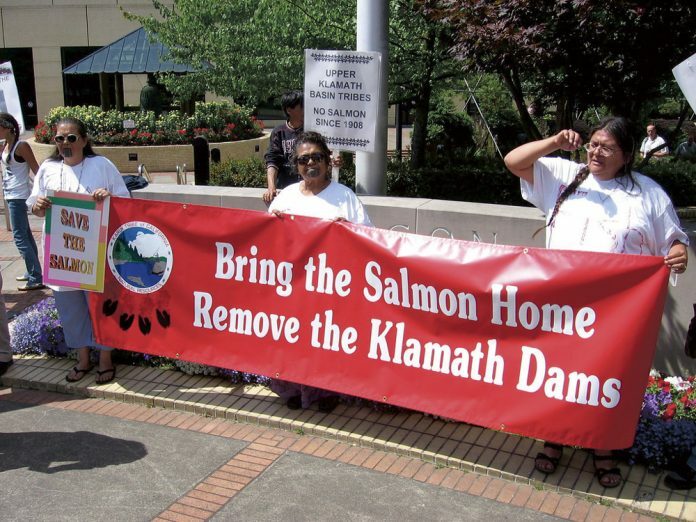 The agreement, under endorsement from federal officials and the states of Oregon and California, stipulates the dams’ removal by the year 2020. This will unfurl over 420 square miles of natural habitat for Chinook and other species, potentially allowing for the proliferation of them by approximately 80 percent. The change in biological environment immediately allowed for salmon population recovery, and help set the stage for further ecological developments.